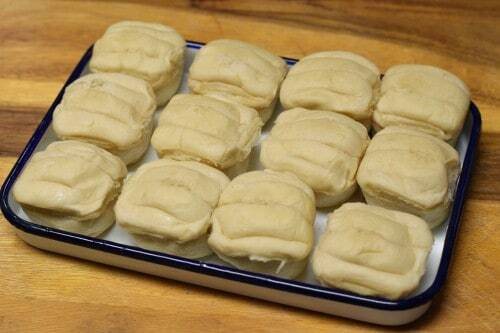 The full, printable recipe for Preston Rolls can be found at the bottom of this post. I wish, so badly, that you could smell these rolls right now. If you were here, you wouldn’t even have to lean in because my entire house smells like freshly baked yeast rolls. My entire house smells like warm, homemade yeasty bread. These rolls were brought into the family by my mother’s stepsister, Wanda. Wanda married into the Preston family and these were the rolls that Preston’s family had at every meal they could. Many old Southern families have a recipe similar (or identical) to this one with various names. 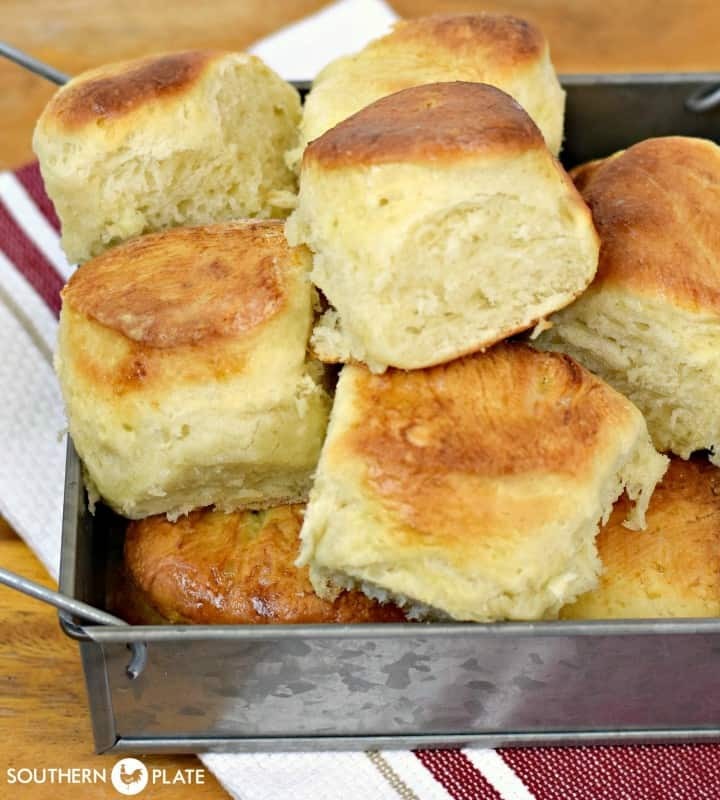 No matter what you call it, this roll recipe is revered and loved today for the same reasons it was so loved in the days of the life of a busy farm wife. 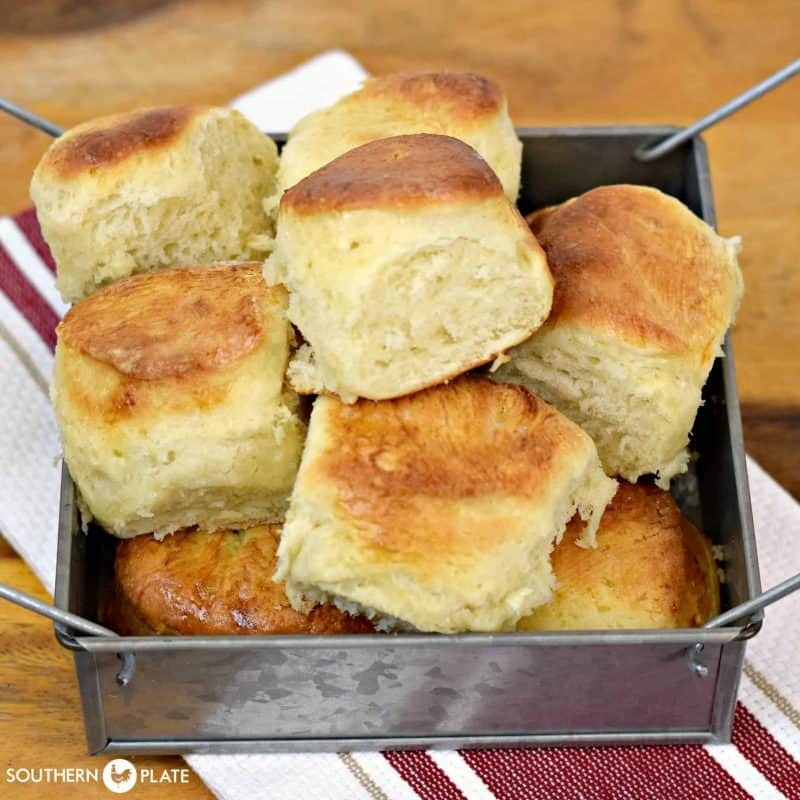 They are made with a from scratch recipe but with a shortcut that allows you to make the dough on the weekends and store in your fridge for up to a week to have fresh, risen yeast rolls even on busy weeknights. 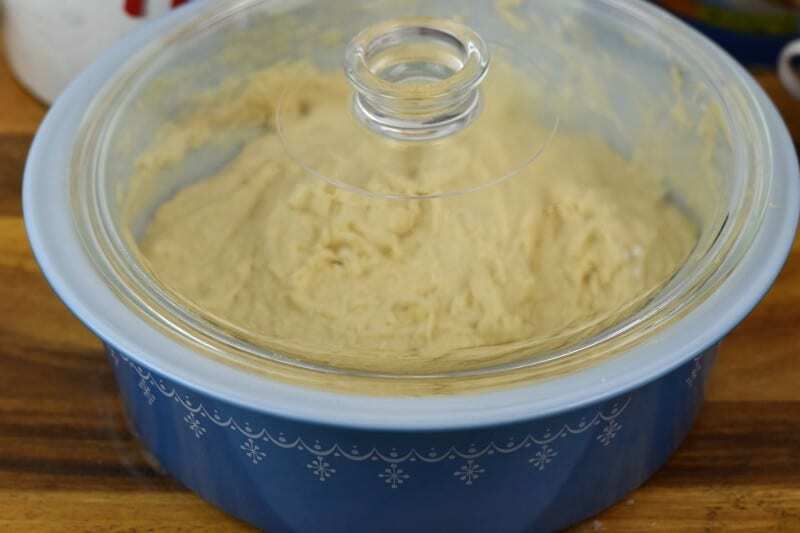 For this recipe you’ll need: all purpose flour, solid vegetable shortening, eggs, salt, lukewarm water, hot water, and three packets of rapid rise yeast. Note: I use Red Star rapid rise yeast. I have never had good luck with Fleishman’s (the yellow packet), it only works for me about 50% of the time (although some people do swear by it) but I’ve never had the Red Star not work so I just thought I’d throw that out there in case you had a choice. Your water needs to be hot, boiling if possible. Combine the shortening and hot water and stir until the shortening is melted. 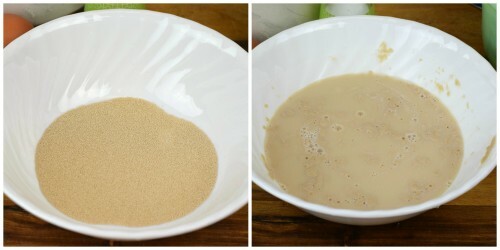 Pour all three packets of yeast in a bowl. Add 1 cup of warm (not hot) water and stir until yeast is dissolved. When dealing with yeast breads, it is important that your water be warm but not hot. A good rule of thumb is to think “baby bath water”, that is the temperature you are going for. If you’ve ever given a baby a bath, you know exactly what I’m talking about :). If you haven’t given a baby a bath before, go for good and warm but not hot, just a little above lukewarm. Let your yeast sit for five minutes and make sure there are some little bubbles on top, that means your yeast is alive and active. After five minutes, your yeast is considerably cooler, add your eggs and stir really well. In a separate large bowl, stir together flour, salt, and sugar. Pour yeast mixture into large bowl and stir really well until a dough is formed. Place a lid on this or seal it with plastic wrap and place in the refrigerator. Before you go to bed, punch the dough down a bit and punch it down again the next morning. However, when you punch it down it is not going to be huge because the refrigerator coldness really slows the growth of the yeast, which is why this recipe works so well. 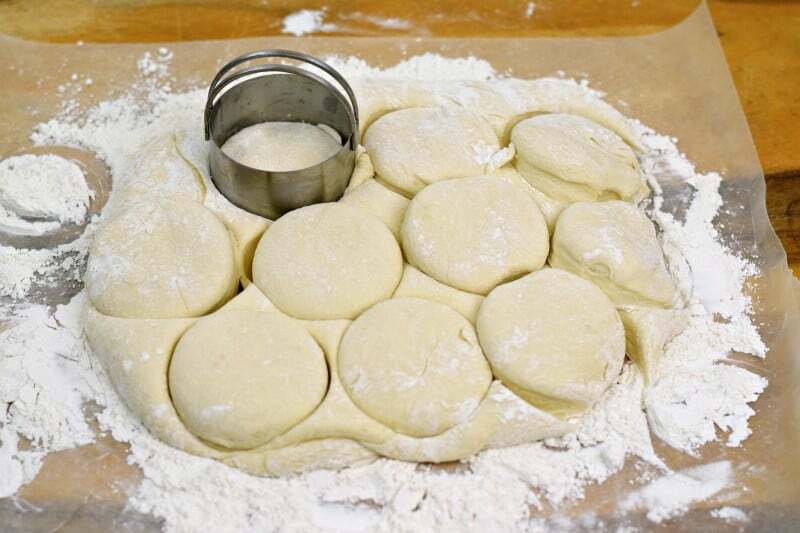 Two hours before you want rolls, take out as much dough as you like and place on a floured surface. This is a little more than half of my dough – this entire recipe makes about two dozen but the beauty is that you can make just a few at a time if you like and have homemade rolls all week long! Knead this just a few times by pressing it into a ball and then flattening it a little bit with the heel of your hands. Repeat that twice and you’re good. Pat it out to about 1/2 inch thickness, or as thick as you want. These are closer to an inch because I wanted big old tall rolls :). I was also photographing this at 6:00 am and getting hungrier with every picture! Cut them out with a biscuit cutter or drinking glass. Place on a greased baking sheet or pan, cover, and set aside to rise for two hours. Okay, now lets talk about this amazing biscuit/roll pan here. This is one of my favorite pans for rolls and such. It fits a dozen perfectly and is ideal for brown and serve rolls (we love those things, too!). This is an enamel quarter sheet pan, 7.5 x 10, and is actually sold in the art department. However, it is porcelain coated and perfectly safe for food – other pans like this are sold in the kitchen department. I learned about these from food stylists who worked on my first book and you’ll see them in Come Home To Supper. You can also see this tray back on a post for my Amish Revel Bars that I did in 2013. I bought this one on Amazon for less than $10 with free shipping. To see it, click here. They only had 20 available when I posted this so if that size is sold out, click here to see one that is just 1/2 inch smaller. I love my 9×9 Brownie/Cornbread Pan (as seen on my Cornbread Pan Sandwiches Post). I have a big 13 x 17 one, too. And I’m not admitting to anything but I may or may not have it in a traditional jelly roll pan size trimmed in red. If you want to see that one, that I may or may not be looking at on my kitchen table right now, click here. We would be here all day if I went over my enamelware collection so I’ll just move on now. Now back to Preston Rolls!!!! Brush them with a mixture of one whole egg and a tablespoon of water to get them nice and golden (that is what I did for this post). Lil’ secret: Sometimes I sprinkle a few grains of coarse salt on top of each one, too :). Bake these at 425 for 15-20 minutes, or until golden. Lets talk about how your kitchen smells right now: Like the best granny from the old days has come to visit and spent weeks making fresh bread for you to enjoy, hot from the oven and slathered in freshly made butter, each day. Think I’m kidding? Just try this recipe and see. These are wonderful anytime but my favorite time to have one is as soon as they are just cool enough to get out of the pan without burning the tar out of yourself, while steam is still rising from the bread and the kitchen is filled with the smell of hot yeast bread, fresh from the oven. The only thing better than the smell of these rolls baking is biting into one while it's warm... Make the dough on the weekends and have fresh rolls on busy weeknights. In a bowl or 2-3 cup measuring cup, place shortening and pour boiling water over. Stir until shortening is melted. Allow to cool slightly while you do the rest. In a separate medium sized bowl, stir the yeast and lukewarm water together until yeast is dissolved. Set aside. 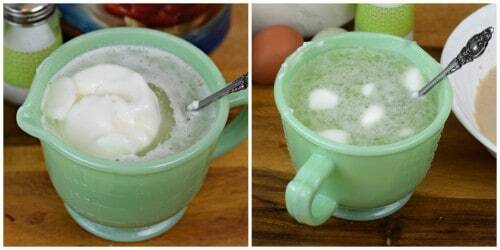 Mix eggs into yeast mixture. Once the shortening has cooled a bit, pour that into the yeast mixture as well and stir well. In a large bowl, stir together flour, sugar, and salt. Add in yeast mixture and stir until a dough is formed. Cover this and place in the refrigerator. Before you go to bed, punch it down and punch it down again in the morning. 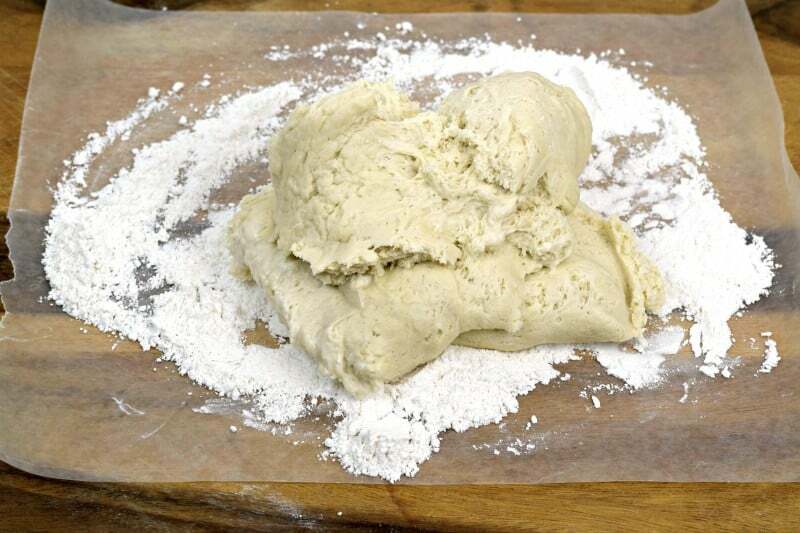 Remove the amount of dough you want to use and place on a floured surface. Knead it just a few times (by pressing it into a ball and then flattening with the heel of your hand, then repeating two more times) and then pat it out to about 1/2 inch thick. 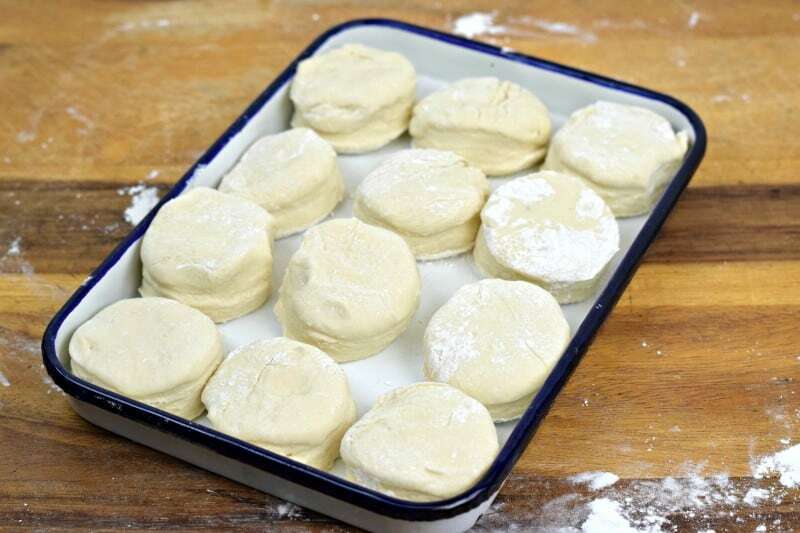 Cut out rolls with a small biscuit cutter or drinking glass. Place on greased baking sheet and cover, allowing to rise for two hours. Bake at 425 for 15-20 minutes. if you'd like your rolls to appear more brown on top, brush them with melted butter or a mixture of 1 whole egg and 1 tablespoon of water. This is purely optional. This dough will keep in the refrigerator for up to a week. 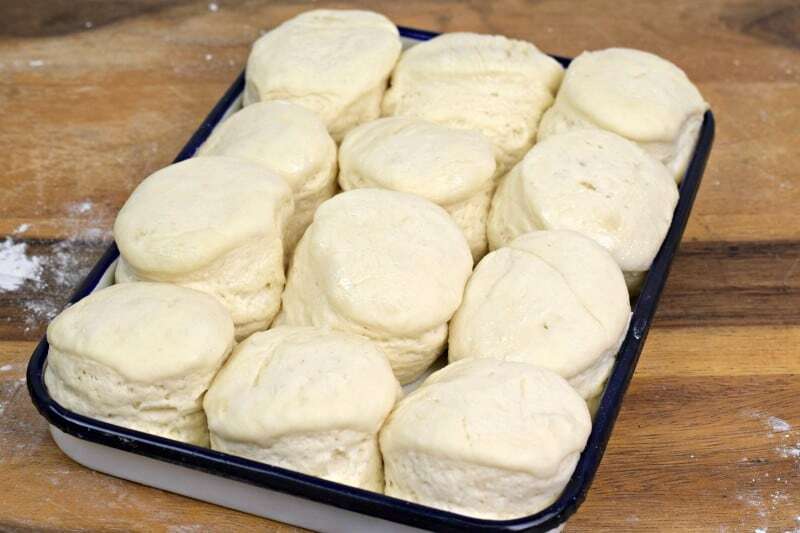 If you’d like to see my family roll recipe, Jordan Rolls, which are ready from start to finish in an hour, please click here. My family loves bread! Bread is mentioned in the Bible a lot, 360 times in the KJV. With that, I will make this bread recipe up for the family tonight. Also, thank you for the tip of knowing how warm the water should be for the yeast. I have always dealt with this in “is it to warm or not warm enough” thoughts. You solved that one with the reference to baby bath water. Thank you so much!!! Have a beautiful day!! WOW, I didn’t know it had been mentioned that many times. What a fun fact to know!! The hubby and I just drooled as I read him my email just now from U on the Fluffy heavenly Preston Rolls! Wow…he is ready & happily offering to take me to Krogers to get the Yeast packs NOW! LOL. Will let ya know how they turn out in a post soon. U just made my Hubby 1 happy man…We both share a luv for Bread n Butter! Jordan Rolls are made bunches in our home. ….but I’m thinking this maybe a New bread recipe I’ll use just as much! Thanks so much Christy! I can’t wait to hear what you and your husband think about them Mandy!! I hope you love them as much as we do! Thank you for the easy peasy roll recipe for busy times! I totally agree on the Red Star Yeast.It was also the only one my mother used all of my life! except back then there was no rapid rise. 🙂 I hope you get the chance to try the rolls Marsha, I think you will love them! I can not wait to try these. I am wondering if they taste like a Herman Starter bread I had. Can’t find the recipe now, but it was a starter I received from a friend at work back in the early 80’s. Thanks for the recipes you give us.. I am not sure what Herman Starter bread tastes like Katie. I wish I could give you a yes or a no answer but am afraid you are going to have to try them and give us a report back on what you think. I hope you enjoy the Preston Rolls!! These look great! Would substituting butter for the shortening cause a problem? I’ve never tried it with this recipe but you might want to check out my Jordan Rolls recipe because I use butter in those. Did you use bread flour? Bleached or unbleached all purpose? Hey Brenda! In both the post itself (under the photograph of the ingredients) and in the recipe card at the bottom I specify All Purpose. I was wondering if I could use coconut oil for these. 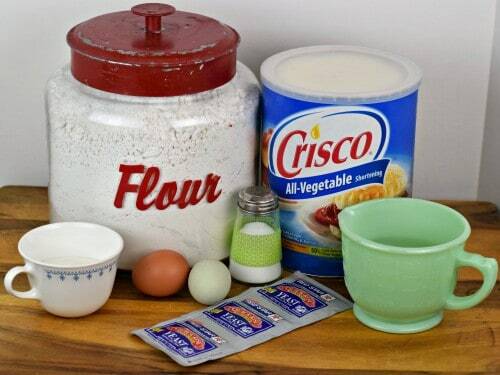 I don’t use or have Crisco. Also, could I not cut them? I usually roll them in my hand and plop them in a cake pan. Not trying to change too much, just wondering? Hi! I made these today using coconut oil and 1/2 freshly ground whole wheat and 1/2 all purpose flour. They turned out lovely! This dough doesn’t require much kneading at all so if you made it in the bread maker it may actually over knead it. Having said that, you can always experiment. Please report back if you do! Thanks for all the links to the enamel pans — I have a few that are old and are starting to rust so I don’t use them for baking. For some reason I didn’t think they were still being made– and I can buy them on Amazon to boot! Awesome! I went to your Amish Reval Bar recipe and thought your comments on Korean TV were hilarious. I will have to look into that. My future daughter in law is Japanese and when we watch Engligh shows we always have the subtitles on for her (even though she speaks excellent English she likes to have the subtitles) I think it would be fun for the family to watch the Korean shows together and then we would have a taste of what she experiences with watching a show in subtitles. We are very picky about what we watch as a family too. Recently discovered the show Granite Flats on Netflix (or youtube) Based during the Cold War. I think your family will like it! Thanks again for another great recipe! Oh, I am going to have to check into Granite Flats. Thanks for sharing Dana!!! Oh Christy, you bring back such good memories with this recipe. As you said, practically every family down yonder has a recipe like this and mine came from my good friend Miss Sara Martin. I met her when I moved down the country 18 years ago and we visited several times a week. She loved to see the children (then 5 and 8) and she became like a great Grandma to them and a Gramma to me as well. The stories she could tell- imagine learning about life during the Civil War – only second hand- in this day and time. Her grandfather, a soldier boy himself, told her stories and she passed those stories on to my children- stories about how all they had to eat was corn meal and water mixed together and patted out onto a stack of broom straw, and then they lit the broom straw on fire and hoped that the heat would cook them before the snipers on the other side saw and made a target out of them. They would grab the half singed, half raw corn dodgers and eat them on the run to keep from getting shot. She told my children and she made history, and the people in it come alive. It was also a good lesson in appreciating what you have, for some have far less and are thankful. Miss Sara also gave me this same roll recipe and we have loved it ever since. If you want to give it an extra boost, you can replace a cup of the flour with a cup of All Bran original cereal- but put it in with the yeast and warm water so it can soften. Oh, and you can make shape these rolls into crescent rolls too if you want to get fancy with it. We lost Miss Sara in 2005 at age 95 and miss her terribly still. Seeing this recipe brings back all the good memories- thank you! Oh my goodness, what wonderful memories of a wonderful woman!!! I imagine Miss Sara was a dear friend to all that met her. Thank you so much for sharing!!! I have rarely had any luck with Fleischman’s, but I figured it was just me! My Nanny used Fleischman’s and, of course, all her baking was perfect, like her. I always use an instant read thermometer to check my water before adding yeast to it. Between 105* and 110* is perfect. What a great tip Beverly, thank you for sharing!! Thank you for this recipe! It reminds me of all the years my mom baked bread. What a wonderful memory!!! I can just smell her house now!! My family doesn’t like overly sweet rolls. Can the amount of sugar be decreased successfully? Otherwise this recipe looks like a real winner (dangerously so!). Thank you Pam! These really aren’t sweet. With 1/2 cup sugar to about 24 rolls you end up with a teaspoon each. It’s really there to give the yeast something to feed off of and get a good start. You can certainly use less and suit it to your taste though! Have a great day! These look wonderful. Want to make them in the morning–if I made them 6am or so in the morning–would it be in the fridge long enough to bake some tomorrow evening? Just too tired to mix it up this evening. I made a batch of dough this afternoon and kept out enough to have rolls for dinner tonight. After making the dough I let it rise for an hour then punched it down and pinched off enough for tonight’s rolls. I cut those out and put them covered in a warm place to rise for another hour. I put the rest of the dough in the fridge for later. I would guess as long as the dough has enough time to warm up and rise, any amount of time between mixing it and cutting it out would be O.K. Right, Christy? Yes. If you make them first thing in the morning, leave the dough sitting out for about half an hour (or so) before putting it in the fridge, then punch them down around lunch and you should be fine by supper. Have a great day, Sibyl! How long wool the dough keep in the fridge? Also, do you think it would freeze well? Hey Kandice! I try to use my dough by week’s end, so about a week but it’s best not to stretch it out to the seventh day if you can help it :). I don’t generally freeze yeast dough as it can be a bit unpredictable, but the completed rolls freeze very well if wrapped up really good :). I just got the post with the roll recipe today and decided to make the rolls right away. The dough came together easily and I kept out enough dough to make some rolls for tonight. They rose up nice and high but by the time I got the oven up to temperature, they had deflated to about half the size they were. It was my fault for not heating the oven sooner and getting them in to cook as soon as they had risen enough. I do have to say the flavor was sooooo good! My husband, who is a bread lover, really enjoyed them and commented on how good the flavor was. I still have about half the dough in the fridge and will make them again in the next couple of days to see if I can get them in the oven fast enough to keep their “loft”. Thanks for the great recipe, Christy. This is definitely a keeper! Hey! First of all, I’m glad you enjoyed them! What you’re looking at in terms of them deflating is that you were actually cooking them on that first rise, which is fine, but the second (and third) is where you get the volume and more developed flavor – and there is no race to get the oven preheated because it is more stable. 🙂 That is why we punch down the dough in the refrigerator, to get it going on that second rise. When we shape them into rolls and let that rise, that is the third. I think you’ll see a big difference the next time you make them and love them even more! 🙂 Have a great day, LaFern! Christy, I love all of your recipes that I have tried, and that’s quite a few. Jordan Rolls are to die for, but with this recipe am wondering – do you have to put them in the fridge, or can you just go ahead and bake them? You can but you’ll miss two of the risings so they won’t be as fluffy or flavorful (the flavor develops over time). I was going to recommend Jordan rolls but you’re already covered there! 😀 Thank you so much Janet! I’m not usually home 2 hours before I start cooking. Can these be cut and set out to rise in the morning before leaving for work, then cooked when arriving home? If I waited 2 hours after we got home to cook supper my family would starve and kill me. Thanks for your help they look yummy. Hey Jennifer! The foolproof way to do this is to let them rise when you can, the full two hours, and then bake them fully. Allow them to cool and wrap well and reheat when you want them. If you set them out to rise at room temp they will rise and deflate over the course of that much time and if you let them rise in the fridge they will most likely not be where you need them to be by the time you get home. One process is way too fast and one way too slow :). What I would do if I were you is cut them out and all that jazz, put them on a greased tray, spray the tops with cooking spray in case they rise too much,cover them loosely with cling wrap or the like and put in the fridge for the day. When you come home they may need another hour-ish to rise once you take them out but that can be your call. I hope this doesn’t sound confusing as I was walking through possible scenarios while I typed 🙂 Baking fully and then reheating will be your best, no fail option though :). Have a great day! Thank you so much. I will try them and let you know what worked. I love the smell of baking bread! My mother made the best bread and buns in the world; her sister, my Aunt Helen, baked a lot of bread, too, and even though I know she wasn’t baking bread every time I went there, in my memory her house always smelled like fresh bread! I can’t wait to make these–my mouth is watering right now but since it’s 1:30 in the morning and I only have regular yeast and not rapid rise, I guess I’ll have to wait a day or two. I agree Beverly, it is one of the best smells ever! Great tip on the Red Star Yeast. I’m going to make these rolls, as they sound delicious. I have your first cookbook and love your recipes. I have followed you for several years now and every time I think you have outdone yourself you go and do it again! 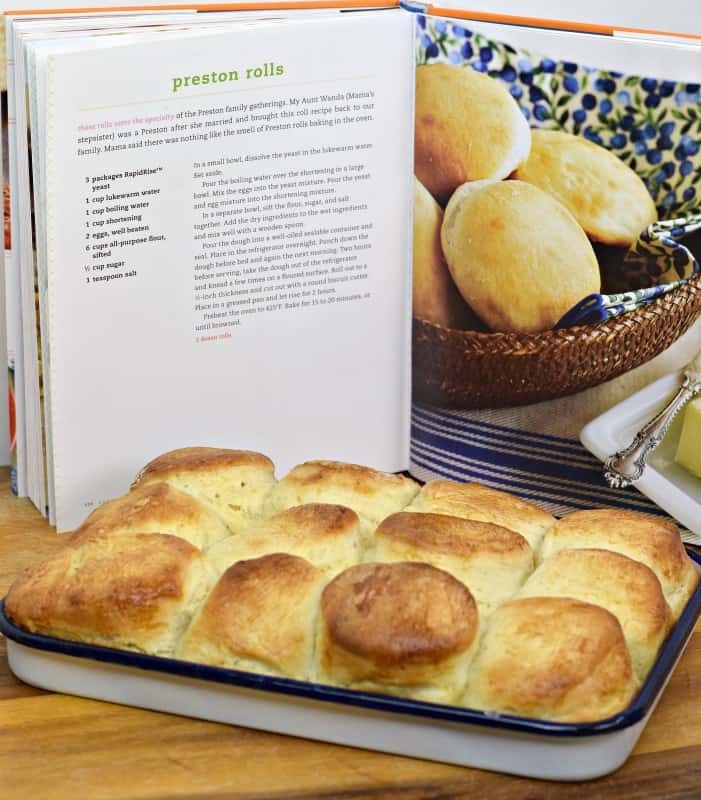 These Preston rolls look amazing and I can almost smell them baking in my kitchen – taking me back to days when I stayed with my Grandma Jackson and she made homemade bread, fried bread and rolls. Her house ALWAYS smelled sooooo goooood! Thank you for the recipe and I love that you can leave it in the fridge for up to a week so I can have fresh rolls whenever I want them. Yummy! I hope you get the chance to try them soon Vicky!! Thank you for all of your support!! Hi Christy! When I make your Jordan rolls, I love how I can just use a pizza cutter and cut the dough into squares. Do you think I could do the same for this recipe too? I love how I can put the dough into the refrigerator and then bake it the next day. This will be very handy on Easter morning when I make the rolls for the family potluck. Thank you for sharing! I’m looking forward to making these! Somehow I missed this recipe when I got your cookbook. Hi Darrelyn, you sure can use a pizza cutter, great idea!! These rolls look amazing!!! I bet your house does smell good after baking these! Oh my goodness does it ever!! Evvvveryone should have this recipe in their pantry! Nothing like a perfect dinner roll. I bet I could eat them all myself. #noshame! I would be right there with you Nicole!! Love a big fluffy roll! These look fabulous! It looks like I have all the ingredients for this Preston Rolls recipe. I know a family that will be very happy when I lay them on the table with butter, cheese and preserve! Or a nice hearty meal! Thanks Christy for the recipe! 🙂 I hope you enjoy!! I don’t know what I did wrong but the rolls fell before I cooked them. Any ideas? There are a lot of variables that I don’t know about so it is difficult for me to tell you exactly, but if you punched the dough down twice, formed it, let it rise for two hours, and then baked, it should have been fine. Temperature of your refrigerator and the room could play a factor in what happened as well, as could the freshness of the yeast.